Here is the latest installment in the series of reviews by Lester Bangs that have remained unpublished since their original magazine appearance. This one is also from the August 9, 1969 issue of Rolling Stone. This time it’s a Chuck Berry review. The Master is back again, and this time he has come up with a record worthy of his reputation. So many grit-jive geniuses–Elvis, Little Richard, and Bo Diddley–have turned stiff in their old age. That’s why it’s a double delight to find Berry, the original poet and scribe of rock and roll, who in many life-worshiping ways exceeded his Minnesota son-in-law, as fresh and as effortlessly committed today as he ever was. The first side of this album includes four of his recent compositions. You won’t get tired of them, They don’t relate to Sixties dope-balling, or the feel of police truncheons crunching into skull-bone but they do ring true, and two of them exude the marvelous old Berry wit, something a great many of today’s owl-faced artrockers would do well to pick up on. Rock is an ailing form without its sense of humor, and Chuck Berry defined a whole comic sensibility. He has not lost that gift: "It’s Too Dark In Here" tells the story of a sheltered chick who finds danger wherever her date takes her, from the party where "there’s ’bout forty people dancing under one dim light" to the back seat of the luckless swain’s car ("So I drive her out the freeway into the country air/ She said I hope you ain’t goin’ park nowhere around here/ It’s dark out there/ Let’s go back in town/ It’s dark out there"). Two of the numbers are slow, rolling blues vocals in Berry’s great "Deep Feeling" style. Both are good funky slow-stomps, sunk with that beautiful, unmistakably original blues feel (remember "Wee Wee Hours"? "Worried Life Blues"?) which is one of Berry’s trademarks. The harmonica player sounds like he’s been listening to Brian Jones and Keith Relf of the Yardbirds, meaning that he exudes not only technical proficiency but taste and imagination. The double-tracked guitars wail and moan like two lonesome Texas banshees reeling in and out of the historic American beerjoint night. That’s mournful as the Berry of the yearning lament always was. It’s the Real Blues the purists are always yapping about. 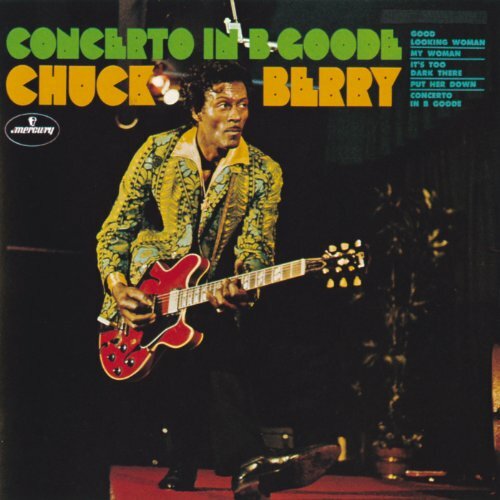 The entirety of side two is given over to "Concerto in B Goode," an eighteen-minute flood of instrumental interpolations on Johnny B. Goode and all of his relatives. For all the thematic and improvisatory repetition, you can’t help but dig it, because it’s so happy, driving, and exuberant, everflowing with the spirit of life joyously lived–the essential spirit of our music. Dig that organ: Dave "Baby" Cortex lives again! Berry’s guitar lines are clear and clean, as amiable and enthusiastic and uncluttered as they were in his two-minute folk epics of 1956 like "Jo Jo Gun." For a man who has always been derided by snobs as a "guitar mechanic," Berry plays with a natural energy and sense of direction that one never finds in the solos of last year’s crop of overblown "jazz-rock" super-groups. On and on and on flows Chuck Berry, duckwalking his great Gibson guitar down the cluttered corridors of rock history. I suspect he’ll still be wailing wisely when the current crop of over-publicized Sensations have faded with their forerunners back into the obscure footnotes of the chronicle of our art.